Alaister Russell (17/06/68) is a talented athlete who, although displaying his remarkable talent in every age group from Junior Boy right through to second-year Junior, and despite winning national championships as a senior man and having a career that most distance runners would seriously envy, there was always the feeling that it could have been even better. He appeared on the scene in 1981 as a Junior Boy and after winning every single cross-country age group championship, had to miss the nationals of 1988 (second year Junior) .through injury. I asked him about injuries and he reckoned that it was not a single recurring major problem but rather a series of injuries. Training at the level he was at was treading a fine line between doing what was necessary and what was too much. There were also particular problems at certain points in his career – eg at one time when he couldn’t get to a track he did some interval training on the road which led to shin splints. All runners can relate to that kind of scenario. He also won every single cross-country age group title in the Western Districts and on the track he was the first athlete since Lachie Stewart to win the 5000m and 10000 metres Scottish Championships in one year. As a member of Law and District through the 80’s and 90’s, he was in a club that seemed to pass on many relays – on the road they seldom appeared in the McAndrew, Allan Scally or National Six Stage events, and on the country they would often do well in the District event and then not have a team out in the Nationals. They also tended to fight shy of some of the classic road races such as the GU Road Race in September, the Nigel Barge and Jack Crawford races in January. At this time they seemed to be a cross-country club in winter rather than a road andcross country club – almost the direct opposite of the Victoria Park habits! He was of course incredibly good on the country and when, later in his career he came to run on the roads he proved to be talented there as well. Before looking at his career it might be better to look at his replies to the questionnaire. How did you get involved in the sport: By winning the 400m at the school sports and by my big brother David. What exactly did you get out of the sport? Enjoyment. Can you describe your general attitude to the sport? Still enjoy watching athletics on TV but no involvement with athletics at the club. What do you consider to be your best ever performance/performances? Winning the Youths’ Race at the Presto Cross-Country at Gateshead – Rob Denmark was second – and my first Scottish title as a Junior boy. And your worst: Scottish Cross-Country Championship at Hawick, 73rd. What ambitions do you have that remain unfulfilled? Winning the Senior cross-country championship. What did you do apart from running to relax? Work on my Dad’s farm. What did running bring you that you would have wanted not to miss? Meeting my wife. You also ran for Border Harriers, what was the connection? 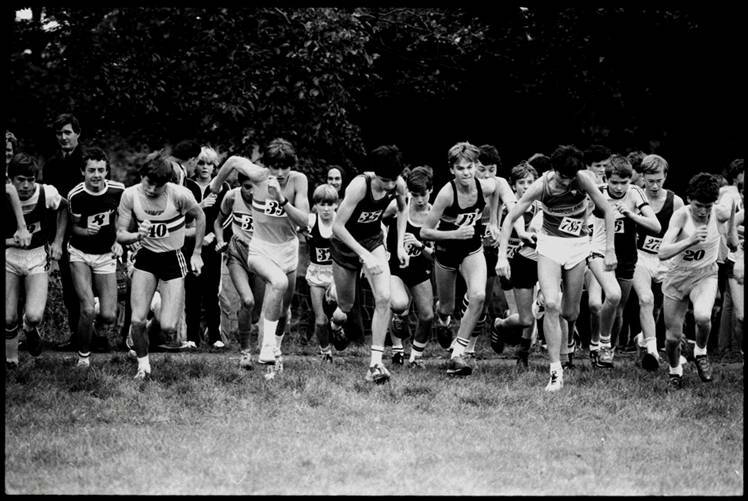 Some Law athletes used to run for Border Harriers in the Eighties and when I reached Senior level I ran in the British League, the North of England 12 Stage Relay, the North of England Cross-Country Championship and in the National Road Relays at Sutton Park. He was first eligible for a national cross-country championship in 1981 as a Junior Boy but finished tenth and followed it up with a victory the following year in the same age group. It was as a Senior Boy in 1983 that he finished tenth again in a race won by Tom Hanlon of Edinburgh Southern Harriers who went on to great things as a steeplechaser. Second that year was John Graham, who went on to a wonderful senior career in most endurance events but particularly as a marathon runner. Just as in the junior boy ranks, Alaister made up for the slip with a victory the following year (1984), ahead of Sam Wallace of Cambuslang. We could maybe start the story with his two victories in the Youths (Under 17) Cross-Country Championships. He started 1985 winning the West District Championships on 25th January at Bellshill and leading his club to team victory, just as he had done as a Senior Boy with Alan Ramage always the second club runner to finish. Traditionally the first runner in the Youth race was selected for the Junior team and the first Junior was normally picked for the Seniors. In February he duly won the National and the season’s highlight for Alaister saw him win the first of his three Scottish International appearances after he won the Youths cross-country title in February 1985: no mean feat for a first year Youth. He finished 60th and was a scoring runner for his country in his first appearance on the big stage. In season 1985-’86 he again made the team. He again started the year by winning the District title in January and, with Alan Ramage third and J Aitchison sixteenth, they won the team title. In February, after winning his second consecutive National Youths title he was picked for the Scottish team, but this time in the international, he went one better and was the first Scottish runner to cross the line in the Junior International when he finished fifty ninth. From leading the Law team, he was now leading the national squad. With his third International ahead of him in ’87, Alaister started the year by unfortunately missing the West District Championship where he had been such a force since he was a boy. At the very end of January, Alaister was selected for the Inter-Counties Cross-Country Championships in Derby. He was first Scot home in the Junior race which he finished in eleventh place, nine ahead of Rob Carey from Annan. By the time the National came along though, he was back in fine form and again ran out victorious. Doug Gillon’s report on the race in ‘Scotland’s Runner’ of April 1987 read: Alaister Russell’s victory over Tom Hanlon in the Junior Race may not have been as convincing a margin as Muir’s 22-second senior one, but it was almost as noteworthy. The young Law farmer has now compiled a record of national titles that not even Muir can boast. Russell was Junior Boy champion in 1981, Senior Boy winner in ’84 and Youth champion for the past two seasons. If you had to identify Muir’s potential successor, look no further. And yet those around Quothquan (Quothquan Farm was where Alaister worked) who know something of the sport swear that his brother David, national Senior Boy champion in ’81, but subsequently injured was an even better prospect. Happily we can report that after surgery and a three-year lay off , David is now back in training. Russell heads a Junior team for Poland which Youth winner Terry Reid (Dundee Hawkhill) is unfortunate not to be in.” Whether the remarks about being successor to Nat Muir were tempting Providence, or whether his brother’s injuries were a portent remains to be seen but 1987 was the last time a separate Scottish team was entered in the international championship and as winner of the National Junior Championship Alaister was selected and in the race he replicated the previous year’s feat when he led the Scots team home with his eighty fourth place. There are no records of Alaister running in summer 1987 – he doesn’t appear in the ranking lists and there is nothing about him in the championship reports, nor is he anywhere in the road rankings for the year. However, in the short relays when October came around he showed the class that made him a triple world championship runner. There was no significant Law & District team in the McAndrew Relay but the club was third in the West District Cross-Country Relay. They had a good four – Douglas Frame was an established figure on the Scottish cross-country and international squad team, Hugh Forgie was a track international over 1500 metres and Billy Nelson was a very gifted runner whom everybody felt could have been superb had he trained as many others did at the time. The team was not only third behind Cambuslang and Springburn but Alaister was fastest in the team with 13:11 and fastest man in the race – ahead of Alex Gilmour of Cambuslang, Adrian Callan of Springburn, Alastair Douglas of Vicky Park and Tommy Murray of Glenpark. 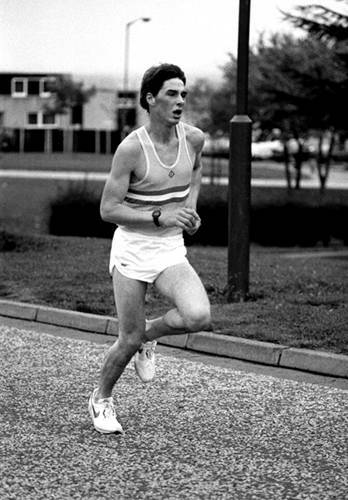 The Lanarkshire County Relays were a fiasco with the senior race being abandoned, in the words of ‘Scotland’s Runner’, ‘race declared void due to runners going off badly stewarded trail,’ It was also at the end of 1987 that Alaister had his first run in the International at San Sebastian where he was ninth in the Junior Race. He also ran there in 1989 as a second year senior in a team with Bobby Quinn and Tommy Murray, finishing seventy second. In the National Cross-Country relays at Galashiels, Law finished seventh with Alaister being sixth fastest only eighteen seconds behind an in-form Adrian Callan. At the start of 1988, Alistair missed out the Beith, Nigel Barge and Jack Crawford races at the start of January, but won the West District Junior Cross-Country race on 16th January by over a minute from East Kilbride’s Ian Tierney. Unfortunately he missed the National, probably through injury and we hear no more about him is in April when he was third in the Open Graded Meeting organised by Victoria Park: he was third in the 3000m in 8:44.7. Missing most road races he did run in the Annan 4.5 mile event on 29th June which he won with 21:56 from Teviotdale’s Davie Cavers. But once again, he was not ranked in the annual performance lists – although it didn’t mean he was not in good form! At the very start of season 1988/89, the club was not placed in the District Relays but Alaister was fifth fastest on the day in 12:06 which was 21 seconds behind fastest man Tommy Murray. Came the National Relays on 22nd October at Bellahouston and again the club was unplaced but Alaister had a good day. “At the end of the first lap, Law and District were ahead thanks to Alaister Russell’s 13:03 effort.” The run was good enough to have him sixth quickest on the day. Unfortunately the club was not in the Edinburgh to Glasgow Relay at this time but maybe it was just as well since the Law top men seemed to avoid the McAndrew and Allan Scally Relays as a matter of policy. Certainly we seldom if ever saw any of the top men turn out on the roads over the winter. He missed several of the open cross country races such as the Bellahouston Park event in December but one he didn’t miss was the SCCU v NI v ScotUnis v Civil Service on the fourth: He finished second to John Robson in that one to help the SCCU team to a comfortable first place. On 17th December it was down to Cardiff for the Miller Lite International where Alaister finished forty sixth to be the fourth Scot to finish. On 8th January, Alaister represented Scotland once again, this time in the Celtic Countries Cross-Country International at the Beach Park in Irvine: he won in 31:42 from A Spellman (Republic of Ireland in 31:56. He maintained top form for the West Districts on 21st January when he finished second to Tommy Murray (40:21) in 41:14, two seconds in front of Alan Puckrin who had been three places ahead of him in Wales. Came the National and Alaister was away down in seventy third position. This was so atypical of his running and ability that it must be supposed that his not-so-good season was down to an injury. Season 1989-90 started with no team from Law & District in the District or National Relays, and given that they again missed the McAndrew Relay at Scotstoun, the Allan Scally Relay at Barrachnie and the GU Road Race, it was a quiet start to the season. Alaister broke his early season competitive duck with a run in the Presto Open Cross-Country Races at Gateshead on 25th November where he was twenty third in the 6900 metres race and sixth Scot to finish. He missed the West District Championships at Troon on 20th January 1990 and was not a member of the Scottish team for the AAU Inter-County Championships at Corby a week later. Not only did Alaister miss the West District Championships that year but there was again no team from Law in the race. Again in 1990, Alaister did not contest the National Championship. 1990-’91 cross country started for Alaister with a fine run in the District Cross-Country Championships at Twechar in Dunbartonshire. With all eyes on Steve Ovett and Steve Binns both running for Annan, the winning team, Tommy Murray and Bobby Quinn tie-ing for third place between them and Nat Muir being only fifth fastest, Alaister was seventh quickest over the course for the Law team to be eighth. The club again did not enter the National Relays and his next run was in the Bellahouston Harriers Open Cross-Country on 24th November which he won in 30:58 from international track and cross-country runner Ian Campbell of Dundee Hawkhill. One week later he ran in and won the Lanarkshire Cross-Country Championships from Charlie Thomson of Cambuslang by twelve seconds. two weeks later, on 15th December he was fourth in the International 10K Cross-Country Championships over the difficult and hilly course at Cumbernauld in 34 minutes behind Quinn (33:20), Mitchell (33:21) and Cavers (33:44) and ahead of Northern Ireland’s Dermot Donnelly (34:05). At the very end of 1990, he ran in the County Durham International Meeting where he was fifty third, five seconds ahead of Adrian Callan but tenth Scot. Into 1991 and on 19th January he won the West District Cross Country Championship without being first to finish! Tommy Murray had that honour but was disqualified so that Alaister who was thirteen seconds behind, was awarded the title. Further drama ensued at the race, held in Clydebank, when third placed Hammy Cox refused to accept his medal for second place because he had not been selected for the Inter-Counties: a newspaper report had said he would not run for Scotland again, so he had not been picked. When they heard that he was in fact available, he was picked for the team – and then he turned it down. Doug Gillon reported on the race in ‘“Scotland’s Runner” as follows. “The cross-country course for the West District Championships was one of the toughest of the year, but Tommy Murray was its master. Murray, however, refused to run in his Greenock Glenpark colours – he had already sent a letter of resignation – and paid a heavy price. Although the former National Champion completed the 7.5 mile course first, in 39:45, for a unique third successive victory, race referee Bob Peel disqualified him promoting Alaister Russell to winner, and Hammy Cox to runner-up. ‘I did not take this decision lightly,’ said Peel, who was faced with a clause in the rules which states that such transgressors as Murray are “liable to disqualification”. He was apparently aware that Murray had been warned prior to the race even by his own clubmates. The decision means that Murray was denied the honour of being the only man to complete the hat-trick since the event was inaugurated in 1985. But for Russell, of Ian Skelly Law and District, there was another unique place in history. The Quothquan farmer became the first athlete ever to win the West title in all five age groups – junior and senior boy, youth, junior and senior. On 26th January, Alaister travelled to Leicester for the CAU Inter-County Championships where he finished forty fourth and sixth Scot. It must have disappointing for him then to miss the National Championships – won incidentally by his old rival Tom Hanlon – and he was not the only one who was marked absent. ‘Scotland’s Runner’ only said that “absent for one reason or another were Nat Muir, the most prolific winner ever, five time world championship team member Chris Robison, former winner Neil Tennant, and current internationalists Alaister Russell and Terry Mitchell..” On 9th March, he made a rare foray onto the roads when he turned out in the Clydesdale Harriers Dunky Wright 5.5 miles race. The race was of very high quality (1st Bobby Quinn, 2nd Allister Hutton, 3rd Tom Hearle, 4th Nat Muir, 5th Alan Puckrin) and Alaister finished nineteenth. In 1991-92 there was a Law and District team in the District Relays which finished seventh and if Alaister ran, then he did not feature in the fastest twenty times, and again there was no team from the club in the National Cross Country Relays. He was however victorious at the Lasswade Cross Country Meeting at Bonnyrigg on 3rd November 1991 when he won by one second from Davie Cavers in 29:15. At the end of the month he had another excellent run to be just two seconds behind George Braidwood of Springburn in the Lanarkshire Championships leading his club to fourth place. Alaister had his reward when on 14th December he he again represented the SCCU in the International and Inter-District Race at Cumbernauld. This time he was fifth on 33:29 against Bobby Quinn’s winning run of 31:50. His next race was also a representative on – the Reebok International at Mallusk, Belfast on 4th January where he was thirty sixth and third Scot to finish in a truly international event where the first three runners were Kenyans. Then at Bellahouston on 18th January, the finishing order in the District Championships was the same as at Clydebank a year earlier but this time all was in order and the result stood with Alistair being second in the championship, just eight seconds adrift. Then it was back on the road for the Grangemouth Round the Houses 10K on 9th February where he finished seventh, three seconds behind George Braidwood. With his form now improving with every year – he now had two very good cross-country seasons linked by a successful summer season, he started to climb back up the field in the National. At Irvine on 22nd February he was tenth in classy company in a race won by Tommy Murray from Chris Robison, Bobby Quinn, Neil Tennant and Adrian Callan. Came winter 1992-’93. There was no Law representation in the West District relays in October 1992, nor were they present at the National Relays. On December 5th 1992 Alaister ran again in the East Kilbride Festival of Road Running and this time won from Brian Kirkwood in 30:55. Alistair did not run in the District Championships in January 1993 and again there was no team from Law & District competing. He did however win the Cumnock Open Cross-Country Championship on 31st January from Graeme Wight of Ayr Seaforth and Mike Gallagher of Maryhill Harriers. There was however no sign of Alaister in the National that year again. He was back to somewhere near his best the following cross-country season, the high spot of which came on December 19, 1993 when he was selected for the 5 Nations International at Turin in Italy, where he was 19th. He was also selected to run in the World CC Trials at Alnwick on 19th Febrruary, 1994 and this time he was 50th and 5th Scot. Nearer home, on 30th January, he ran in the West District where he finished third This was followed by a fine run in the National where he was twelfth, finishing ahead of runners of the calibre of Terry Mitchell and marathon man Davie Cavers. He was twelfth in the National the following year as well beating David Ross of Racing Club on the line, with both runners recording the same time. 1996 started with the Coca-Cola International at Mallusk in Ireland on 6th January. Alaister was seventeenth and second Scot behind Tom Hanlon, ahead of Glen Stewart, Adrian Callan. On 10th Feb in the National at Irvine, he made up for missing the previous year’s event by finishing third behind Bobby Quinn (36:46), Tommy Murray (36:56) while he was on 37:02. This was followed on 3rd March by the BAF cross-country championships at Ashington, County Durham where he was twenty first and third Scot. The November 1996 Edinburgh to Glasgow was the first he had ever run and he was sent out on the sixth stage. By that time the Law fate had been sealed – they had been running twenty first from the end of the first stage : Alaister could do nothing about it and held the place despite pulling up a lot of distance on the man in front. The following week he ran in the West District Championships at Girvan and he was beaten again in these championships by Tommy Murray who ran 32: ro Alaister’s 32:46 with Charlie Thomson a further ten seconds back. Alaister did not run in the National that year at Perth. Following the poor performance the previous year, in November 1997 there was no team from Law in the E-G, however on 29th November in the West Districts he was second, 12 seconds down on T Murray – again! On the 13th December in the Inter Districts at Cumbernauld he ran well to be fourth. In the National he was eighth, sandwiched between Neil Wilkinson of Cambuslang and Ken Chapman of Racing Club. Alaister had another go at the Edinburgh to Glasgow in November 1998 with Law once again in the race. They finished fifteenth with Alaister on the second stage – he seemed to relish the challenge of facing the best men in the race when they were close enough .He would go on to run the same stage four times before the event was discontinued. this time he took the club up from ninth to fifth place on the hardest stage in the race, with fifth fastest stage time. Another good National at the end of the season saw him ninth. At the finish there were three runners within one second of each other three within a second of each other, Colin Donnelly was seventh in 39:31, Steven Conaghan eighth in 39:32 and Alaister ninth in 39:32. His next National would be in 2002 with a thirty second place finish. In November he ran the second stage of the Edinburgh to Glasgow and this time he brought the team from twentieth to thirteenth with the second fastest time of the day to see them finish ninth and win the most meritorious medals. In the E-G in 2000 he was again on the second stage, again picking up places before seeing club finish twelfth this time round. His own run was another good one where he pulled up from nineteenth at the start of the leg to thirteenth for the handover. In 2001, he was to run his last Edinburgh to Glasgow Relay and it was another run over the by now familiar second leg. Second fastest again he pulled the team up from fourth to third and the club finished eleventh and in the National, as already mentioned, he was thirty second. In 1991, he started with third in the West District 5000m in 14:36.62 behind Kilbarchan’s Bobby Quinn and Tommy Hearle. Missing the SAAA Championship in July, he raced on 27th July in AAA Champs, where he ran 14:17.22 for the 5000m which ranked him eighth – although the seven in front included Ian Hamer (Welsh) and John Sherban. Rankings in Summer 1997 were again in the 3000m, 5000m and 10000m. 3000m – 10th – 8:30.6; 5000m – 11th – 14:27.6. 10000m – 3rd – 30:32.6. The 5000m and 10000m won him the National Championships. The Annual Yearbook said of the feat: “Once again the national title at Meadowbank provided one of the closest races of the summer when Alaister Russell outsprinted Daniel Leggate in a slow run race with just one tenth of a second between them at the finishing line.”; . “With a winning sprint over the last 200 yards, Alaister Russell won the national title on one of the hottest days of the summer. H e thus became the first runner to win both 5000m and 10000m titles in the same year since Lachie Stewart won the linear equivalent 3 and 6 mile double in 1968 in a 24 hour timespan, in 14:16/29:12 (converted times) against Russell’s 14:48/30:33.” ROAD RANKINGS – 10K – 21st – 30:40; half marathon – 9th – 66:20. In 1998 he raced well over the summer on both road and track and again he medalled in the SAF 10000m track championships with his fastest time of the year. The figures were: 5000m – 11th – 14:33.56; 10000m – 3rd – 30:17.03; ROAD RANKINGS: 5 miles – 11th – 24:37; half marathon – 4th – 67:10. There was only one appearance in the track lists in 1999, in the 5000m where 14:40.1 was good enough to place him thirteenth in Scotland. There were however three appearances on the road lists. ROAD: 10K – 11th – 30:15; 10 Miles – 9th – 51.38; half-marathon – 2nd – 65:53. Into the new millennium and there was the best series of times for several years – 2000m – 2nd in 5:25.8; 3000m – 7th in 8:25.64; 5000m – 5th in 14:47.06; 10000m in 3rd – 30:33.07. The 10000m time was good enough for second in the SAF Champs behind Tommy Murray. When asked about his track running and his involvement with Border Harriers, Alaister said that he ‘didn’t have the turn of speed’ needed for track success and so he often lost out at the end of races. He joined Border Harriers with the encouragement of team mate Hugh Forgie who was already a member, because he felt that he would get better races in the British Athletics League. Although he never ever ran in al four BAL meetings in any year, he did run in at least two a season. Some of these were memorable races such as when he was second to Spencer Barden (14:10) at Portsmouth in 14:17: they had been together all the way until the final two laps when Barden broke away. On the road he ran in the Northern 6-Stage and 12-Stage as well as in the National 6-Stage and 12-Stage. On one occasion he ran into third place in the 6-satge at Liverpool when the Borders team finished third team. He also turned out over the country for them finishing eighth in the Northern Championships at Manchester in 1998. He was coached initially by Bill Dickson who was a friend of Alex Naylor the Scottish group coach for endurance events for many years after taking up the sport and Bill came to the opinion that he had taken Alaister as far as he could and that for him to develop further he should move on. Alaister then trained with Ian McCafferty for a while and then moved to train with Tommy Boyle where he did the sessions with Yvonne Murray while Robert Ftizsimmons (Bellahouston) was training with Tom McKean. The relationship was not long-lived and Alaister went back to his own training. For track work he did some sessions with Ian White (L&L Track Club) who was a 1:52 800m runner and these helped with the speed that Alaister needed. For several years he helped out by coaching in the club: their main training venue is at Wishaw and there were many youngsters at Carluke who were interested in the sport. Alaister set up a group at the Carluke track with the help of some parents and they fed into the main club. Unfortunately other commitments that he is now unable to carry on with his coaching and he currently has no active involvement in the sport.